Craps is the most exciting game in the online casino, hands down. If anyone tells you different it’s because they’ve never been part of an epic roll. No other casino game brings people together like craps so if you like cheering, high-fiving and feeling like you’re part of a team, craps is the game for you. In this article we’ll cover the basics of how a craps roll works and how to make the most common bets. Then we’ll explain craps strategy, which bets to avoid and we’ll also focus on the one bet in craps that has no house edge at all. Craps is one of those games that looks confusing but becomes really easy once you learn the basics. If you feel confused or overwhelmed trying to learn, don’t worry. That’s common. The easiest way to learn is to get familiar with the basics and then find a table that’s not too busy. The dealer will be happy to walk you through the game. 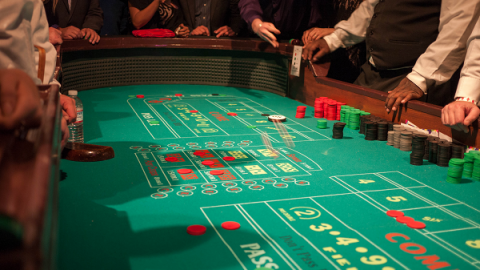 Up to 16 people can play on the same craps table at the same time, plus three dealers, so it can get hectic. When you get to the table look for an open space on the rail. The felt has the same betting pattern printed at both ends and you’ll be using the one closest to where you stand. The person throwing the dice during a roll is called the “Shooter” and rolls two dices at the same time. The values of each die are added together to determine the game’s outcome. If you don’t have casino chips yet, give your cash to the dealer and he’ll give you chips. Don’t try to do this in the middle of a roll. You might interfere with the dice so wait until the roll is over and the puck is turned to “Off”. Then put your cash on the felt for the dealer to change. Each roll has two distinct parts. The first is called the “come-out roll”. Before the come-out roll most players bet on the “Pass” line which basically means you’re hoping for the shooter to win. You can also bet on the “Don’t Pass” bar which means you’re hoping the casino wins. The shooter rolls a 7 or 11. All Pass line bets win and pay 1 to 1. Bets on the Don’t Pass bar lose. If this happens the same shooter will start again with another come-out roll after everyone has made new bets on the Pass line or Don’t Pass bar. The shooter rolls a 2, 3 or 12, all pass line bets lose and the roll is over. The come-out roll is a 4, 5, 6, 8, 9 or 10. That number becomes the “Point” number and the roll enters the second stage. After the point number is set all pass line bets stay where they are and everyone has a chance to place more bets before the shooter continues rolling. The most common bet to make is called the “Odds” bet. You can make this bet by putting chips directly behind your Pass line bet. Since there’s zero house edge on the Odds, casinos limit how much you can bet. It’s always a multiple of your pass line bet and will usually be posted at the table. Look for a sign that says 4x Odds or something similar. Now if the shooter rolls the point number everyone’s Pass line and Odds bets win and the shooter starts again with a new come-out roll. If he rolls a 7 he craps out and everyone’s Pass line and Odds bets lose and the roll is over. If the shooter rolls anything except a 7 or the point, the roll continues until the shooter either hits the point or craps out. If the shooter hits the point he starts again with a new come-out roll. In addition to the Pass line and Odds bets there are tons of other bets you can make throughout the roll. We’ll explain them all below. The truth is, however, a lot of them have a really high house edge and should be avoided completely. The best craps strategy is simple. Bet the Pass line and then max out the Odds bet. That’s it. The Odds bet is one of the only wagers in the entire casino with no house edge at all and that makes it by far the best bet on the craps table. In real life most people don’t stick to the smart strategy. Craps is popular because it’s an action game and you’ll see people making a lot of bad bets, often relying on superstition. How you play is up to you and it depends on your priorities. If you just want to have fun and you’re okay with more risk, betting on longshots can be a blast. If you’re playing to give yourself the best chance of winning in the long run, stick to the smart bets. Come and Don’t Come – These bets work the exact same way as the Pass and Don’t Pass bets except you can make them after the point number has been set. When you bet the Come box it becomes your own separate little game. The next roll is considered the come-out roll for that Come bet so if it’s a 7 or 11 you win. If it’s a 2,3 or 12 you lose and if it’s any other number it sets the point. Then if the point is rolled before a 7, your Come bet wins. The house edge on the Come and Don’t Come bets have the same low house edge as the Pass and Don’t pass bets which make them smart bets. Place Bets – After the point has been set you can bet on 4, 5, 6, 8, 9 or 10 being rolled before a 7. Just throw your chip(s) towards the dealer and tell them to place whichever number you want. The house edge for Place bets is best for 6 and 8 but they’re all relatively low. Placing 6 and 8 has a house edge of 0.46%, placing 5 and 9 has a house edge of 1.11% and placing 4 and 10 has a house edge of 1.67%. Proposition Bets – This is the category of bets you should avoid if you want the best odds of winning. Proposition bets are one-roll bets you can make at any time. They include: The Horn which means you want a 2, 3, 11 or 12. The Field which means you want 2, 3, 4, 9, 10 or 11. Hard Way bets which mean you want a number rolled a certain way, like an 8 rolled with both dice showing fours, for example.